Previewed at: Reel Room, Sydney, on 6 July 2017. The first thing you notice about director /writer/editor David Lowery’s A Ghost Story is the novel framing of cinematographer Andrew Droz Palermo’s images, the rounded corners of the film’s classic 1:33 ratio making it look like some kind of old home movie found in the attic. The second thing is Daniel Hart’s eerie but beautiful score; it’s otherworldly which, we’re soon to learn, is very fitting for the soundtrack of this original work. Both devices warn you that you’re about to set foot outside cinema’s usual comfort zone. It’s certainly a far cry from Pete’s Dragon, Lowery’s most recent film, but has much more in common with his 2013 movie Ain’t Them Bodies Saints, most obviously in the two leads, Casey Affleck and Rooney Mara. In long takes, we enter the quotidian life of C (Affleck) and M (Mara), a loving young couple living the dream somewhere in Texas but there’s a bone of contention between them. While M’s packing up the house in preparation for an imminent relocation, C lets it be known that he’s not happy about the move, feeling that M has made the decision without him. He’s a chilled dude, a musician content to stay at home working on his compositions. She’s restless, not ready to succumb to suburban mundanity just yet. Shockingly, death intervenes when C is killed in a road accident in front of the house. Soon though, he returns home as a sheet-clad ghost, the archetypal image of a deceased spirit recognizable to all. Unable to move on, he’s doomed to watch as the life of the house continues. It seems he’s stuck in what Catholics would call Limbo or Tibetan Buddhists the Bardo, caught somewhere between Life and Death. Lowery’s film is a Terrence Malick-like meditation on love, the passage of time, the human condition and the inevitability of death. It’s a cerebral work that won’t appeal to a broad audience but it’s not without its charms if you’re prepared to surrender to it and go with its flow. On a purely sensory level, it’s beautiful to watch and to listen to and Affleck and Mara are remarkable together. Lowery has said, "This movie is a very explicit attempt to deal with time passing - it's going to move forward whether I like it or not, and eventually everything I've worked towards or achieved will become meaningless." 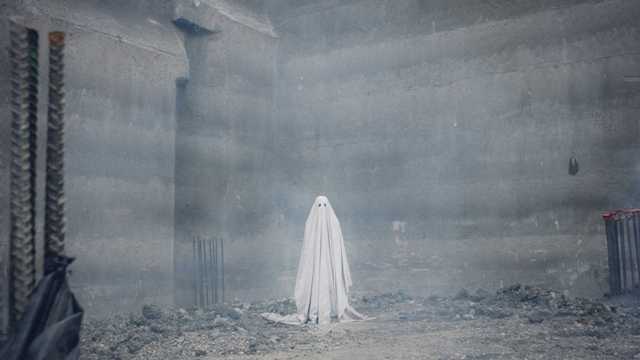 To me though, A Ghost Story is not as bleak as the director makes it sound. Somewhere in it there’s the hint that, despite the enormity of Death, the human spirit endures.